← Trap Talk / Get Your Traps Out There! My idea of a wild night. Any time a married man comes rolling in at 2 a.m. there had better be a story. On Wednesday 8/5/15 I experienced such a night and it was probably the craziest night of my entire life!!! No alcohol involved in this fiasco, just BEES, police, barking dogs and a car with the exhaust broken right before the catalytic converter. Sound like a good time? I have a 1997 Chevy Cavalier that’s seen better days. The car is getting long in the tooth and about every time I’m out something falls off of it or a new issue comes up. The exhaust had been a problem for 2 weeks. I was North of Richmond on 7/22/15 picking up 3 full traps and a raccoon got hit by the vehicle directly in front of me. It was flopping around in the road and I couldn’t miss it. Unfortunately it was a large animal and went under the car like a bowling ball striking the exhaust at some point and the throaty roar of a four cylinder white-trash beater car was born! Between work and the late swarms I hadn’t had time to fix the car so I was just listening to it and taking ribbing from co-workers, friends, and relatives. The 8/5 Odyssey began at 20:00 (8pm). I left work heading North to pick up the first trap. It was at a location that caught three colonies for me this year. The host at this site has really gotten into the process after witnessing several swarms coming in over the years. They are always very prompt in alerting me of activity and oftentimes take pictures and message me on Facebook with the good news. 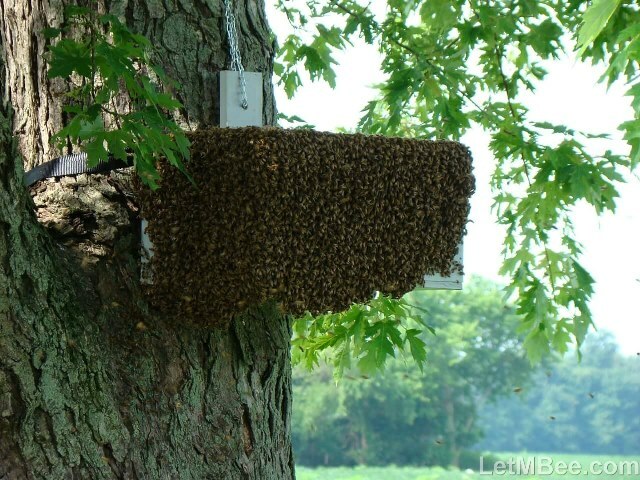 I must have caught at least 10 there since 2011 so they know what a swarm looks like. They told me this was the largest they had ever seen. 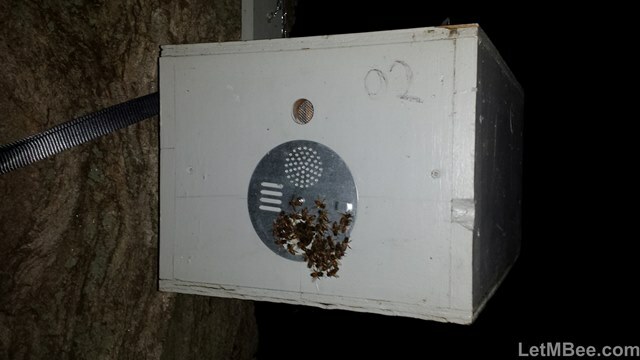 I arrived shortly before dark and looked Trap05 over for any holes where bees could escape after the disc was closed. I taped off ONE hole in the front of the trap. There was hole in the back, but I thought it looked like it was too small for any bees to escape. 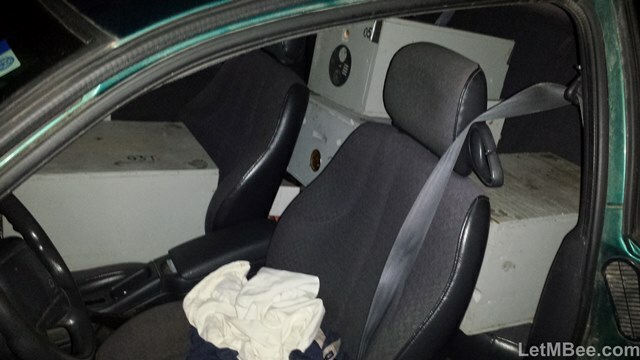 It was taken down and placed in the back seat of the car. I said my goodbyes to the trap-hosts and headed on down the line. At this point it seemed as though it was gonna be just an ordinary trap pickup night. By the time I arrived at pickup number three it was almost 23:00 (11:00 pm). 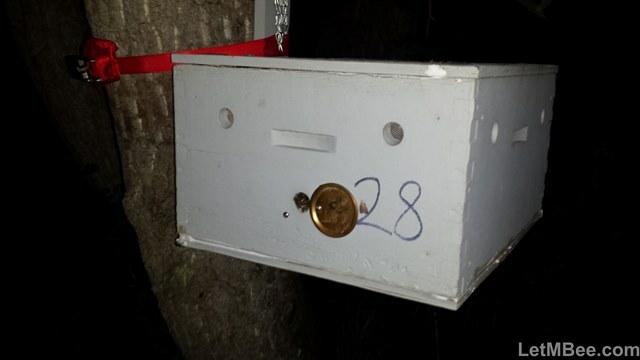 Things went well getting Trap02 down from the tree. I didn’t even have to tape anything! After being carried to the car the trap was placed on the ground so that I could shine a flashlight inside the car just to make sure everything was OK in there. Holy <EXPLETIVE>! Things were not OK! 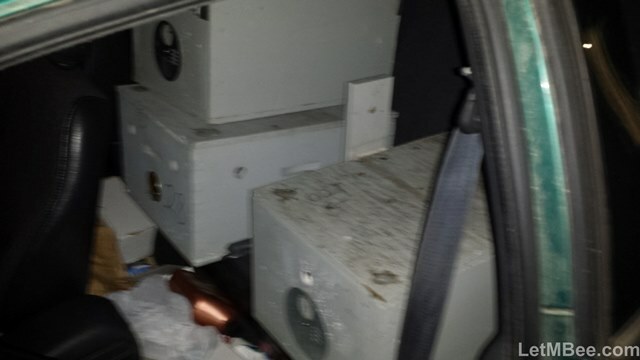 Turns out that little hole in Trap05 was large enough for bees to get out of AND THERE WERE A LOT of bees crawling/flying all over the interior of the dark car. I immediately removed my veil and gloves from the trunk and went to work getting Trap05 and Trap28 out of there. 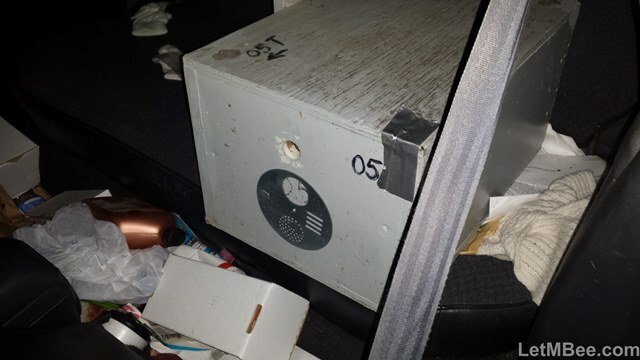 The source had been found AND TAPED, but that didn’t do anything for the bees crawling around in the car. I hated to do this, but crawling bees inside a dark car could have been dangerous. They had to either be removed from the car or killed. I still had about 60 miles and 2 more stops to make! Trap05 and Trap28 were placed on the hood. A spray bottle was used to remove the bees that were crawling on the surface of the boxes. After a tense 15 or 20 minutes about 90% of them had been cleared from the car. By that point I was pretty worked up and the trap host who works second shift offered me some water. Don’t forget that this is all going on in the driveway in a small town. I can only imagine what it must have looked like to the neighbors if they were up. I have found that I LOVE trapping bees IN-TOWN. 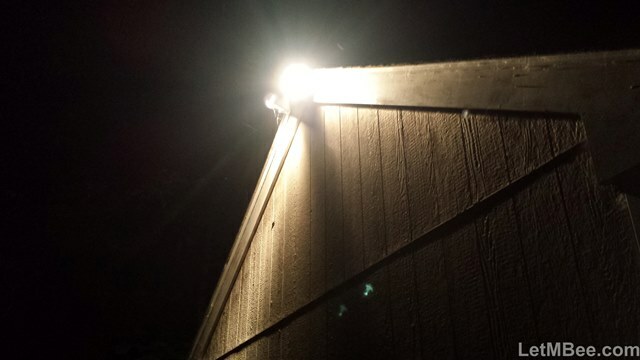 I noticed immediately that there is way more ambient light. Since I don’t have to hold a flashlight trap removal is WAY easier. Normally people have their air conditioning on during swarming conditions so they typically don’t even notice I’m around. In a quiet car with no mishaps I can be in and out before anyone notices me. UNFORTUNTALY this was not the case on this particular night. It seems I had attracted some attention. I did NOT want to get in there. After a glass of water and maybe 10 minutes of shooting the breeze with the trap-host I worked up the courage to get back in the car and head to the next location. I walked out and noticed the sound of a parked car running across the street. I walked around my car with the flashlight making sure there weren’t anymore bees loose. Soon I had light being shined on ME! The car across the street was a town cop in an unmarked car. I have never heard of anyone perpetrating a crime in a bee veil and gloves, but I will admit that things probably looked a little suspicious in that driveway. I kinda turned to face the cop and half heartedly waved. They turned off their light and drove down the street. Trap03 was located just on the outskirts of Richmond. I was able to get there without going through town sometime around 12:30 or so. The hosts at this site are some of my very best friends. I know they were trying to be helpful to me by leaving on the lights, but when I got there bees were on the front of the box and flying around. Luckily I had refilled my spray bottle at the last stop and commenced to misting water on the face of the trap and in the surrounding area. After about 15 minutes or so everybody was home and the door was closed (no tape needed this time). At this point the lights came in handy for getting the trap down. Don’t mess with mean dogs. Whew!!! All traps retrieved. It was running late, but I was only about 5 miles away from where I wanted to place Trap03 so I figured, I’d go ahead and drop it off. I had warned the Hive hosts that I would be bye late with a loud car and they said it wouldn’t bother them at all. So down the road I went forgetting 1 VERY IMPORTANT DETAIL of that hive location. In actuality I forgot about 3 details. I turned into their driveway and the headlights illuminated their 3 dogs. I shut the car off and opened the door and immediately all three started barking and circling the car. Normally dogs don’t bother me, but multiple dogs in the dark barking at you is unnerving. If you’ve never experienced this give it a try… One of the dogs at this site makes me very nervous even in the daytime. 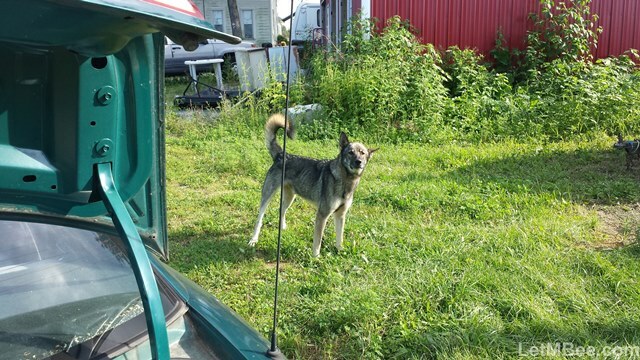 He had never done anything to me at that time, but since he has pinned me against my truck and has lunged at me several times. More on that in a future post. On 8/6 at 01:00 a SNAP decisions was made and some profanities were uttered. I sat down, shut the door, start the engine and headed for home. It was getting late and I was still a good ways from home. A half an hour later and I was wheeling it into my lane. Trap05 was placed in a permanent location here at the house between 1501 and 1502. After hiving it became known as 1517. Trap03 Trap28 and Trap02 were placed on temporary stands and relocated over the following couple of days. Finally just a little before 2 a.m. I crept in the house. Everything was quite so I prepared for bed. It was a good feeling to close my eyes and get some shuteye… As stated previously… Any time a married man comes in at 2 AM there had better be a story…. Well that’s MINE!!!! What a NIGHT! Have you had any hair raising bee stories? If you have been keeping bees long I bet ya do. 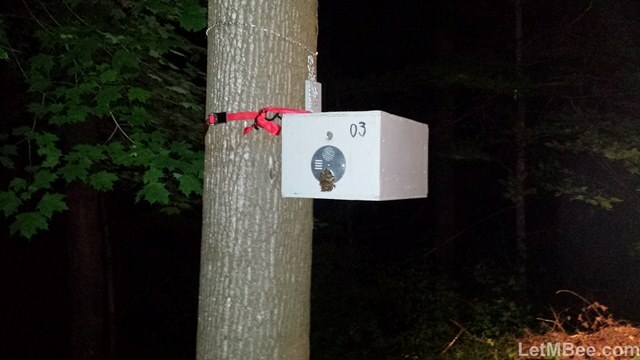 This entry was posted in Posts, Rants, Swarm Trapping, What's going on.. and tagged Indiana Beekeeping, swarm trap, swarm trapping, treatment free beekeeping. Bookmark the permalink. Great story! You can’t make that stuff up! Enjoyed the story. How many traps do you usually have up at one time? For the last several years I had 30. This year I increased to 40. Doesn’t matter how many you have total once they start hitting keep 1-3 of them back so that when a full one is taken down an empty one can go right back up. It can be tricky to remember where they all are. I currently use G-Notes for recording locations.